History News: World’s Oldest Ceremonial Fire? Atlas Obscura publishes a daily newsletter that is one of the most interesting sites around. Its staff works tirelessly to ferret out odd or unusual places in the world for their brief articles, accompanied by photos and information about how to get there. Today they ran one about a beautiful site of worship in Yazd, Iran, a Zoroastrian temple that houses an Atash Behram (Fire of Victory). Fire and water are the agents of ritual purity, used to produce clean, white ash for ritual purification ceremonies. This brick Zoroastrian temple holds a fire that has burned for more than 1,500 years. The ancient flame has been kept alive, in various locations, since 470, during the Sassanian Empire. The only temple of its type located outside of India, it has been situated in Yazd since 1934. 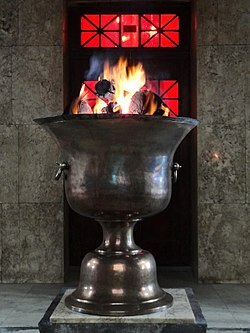 Today, the sacred flame burns within a bronze vessel and is protected by a glass wall. Only the temple priests are permitted inside the sanctum, where the flame is fed with dry wood. In present-day Zoroastrian tradition, adherents bring offerings of pieces of sweet smelling wood, such as sandalwood, which is received by a priest wearing a cloth over nose and mouth to prevent polluting the fire with the breath. He will enter the sanctuary alone, and, with a pair of silver tongs, place the offering in the fire. He then will use a special ladle to present a small amount of the holy ash to the layperson, who anoints his or her own forehead and eyelids, then takes some ash home for their private rituals. There are many other features of this interesting and ancient religious practice, which is quite complex, with plenty of information available on many internet sites. There are three different levels of ceremonial fire for three different purposes, for example, and 16 sources of fire. It has been enjoyable and edifying to learn about this particular one, which is similar in some respects to the Christian Ash Wednesday. Each year on Midsummer’s Eve, when summer begins here in New England, I stroll around my garden searching for the little yellow blooms of St. John’s Wort (Hypericum perforatum). I’ve never planted any. Around here it grows as a wildflower, and a few volunteers show up each year, in various places, sometimes the same and sometimes not. From the time of the ancient Greeks, it was considered to have magical powers to ward off evil and protect against diseases, and since early Christian times, the feast of St. John the Baptist, June 24, has been considered the best day on which to pick the plant for such uses. Some sources have said the red spots appear on the leaves on August 29, said to be the anniversary of his beheading. And blushed as she sought the plant of power. “St. John’s wort doth charm all the witches away. Be sure not to step on this plant, or a Faerie Horse just may steal you away. But perhaps you can avoid that fate by wearing a few leaves and flowers as a necklace. Medicinally, noted herbalists used St. John’s Wort in ointments to heal deep wounds, bruises, and venomous animal bites. In infusions, it could dissolve stones in the urinary tract or kidneys, and cure fevers, jaundice, gout, and rheumatism. It was also good for bed sores, lockjaw, and insomnia. Native Americans made use of St. John’s Wort against diarrhea, skin injuries, bleeding, and snake bites. 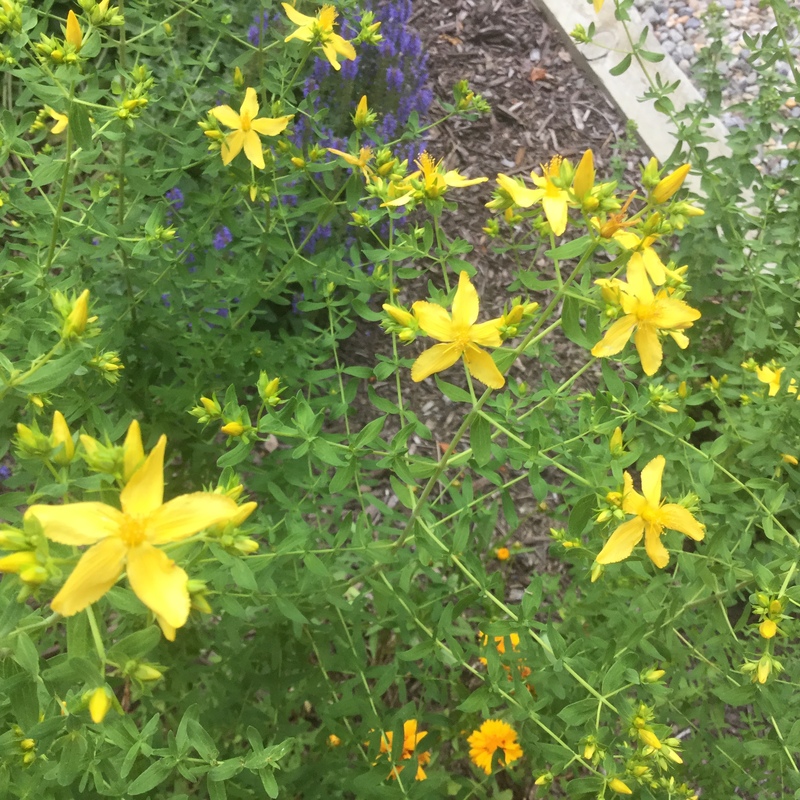 In Europe, it has been used for centuries to alleviate nervous disorders, hysteria, and insanity, and very recently, St. John’s Wort has been newly discovered as a modern treatment for depression and virus infection. Today, there are many commercial preparations available as standard oils and liquid or powdered extracts. Now that researchers are taking this herb seriously for medicinal purposes, who knows what knew applications might be discovered? This nursery rhyme probably dates to the Middle Ages, when England was the major player in the international wool trade. A tax had been placed upon wool, with 1/3 going to the”master” (local lord), 1/3 to the “dame” (the church), and the rest to the “little boy” in the lane (local farmer). In recent years it has become a subject of controversy, with early childhood teachers converted black sheep to rainbow sheep to avoid any hint of racism. The color of the sheep in the rhyme must also be of some significance. Black wool is difficult to dye and would therefore seem to have little use in making textiles. However many shepherds prized black fleece and kept one dark sheep in a flock of white ones. When the fiber was carded for spinning a little of the black was mixed in with the white to produce a light-grey wool. The cloth made from ‘grey’ wool was believed to be warmer and more weather proof than that made from only white fleece. Unlike the pure black wool it could be easily dyed. I’m not sure that a breed of sheep with pure black wool actually exists. In days of yore, a “black” sheep was any sheep that wasn’t white. Most dark fleeces have at least a tinge of noticeable brown or gray in their fleece. If anyone knows of a pure black, I’d like to see a picture and know the breed. Too bizarre, but, according to Atlas Obscura , very true. You know those little men in the pointy hats that we now refer to as garden gnomes? They now have a history. 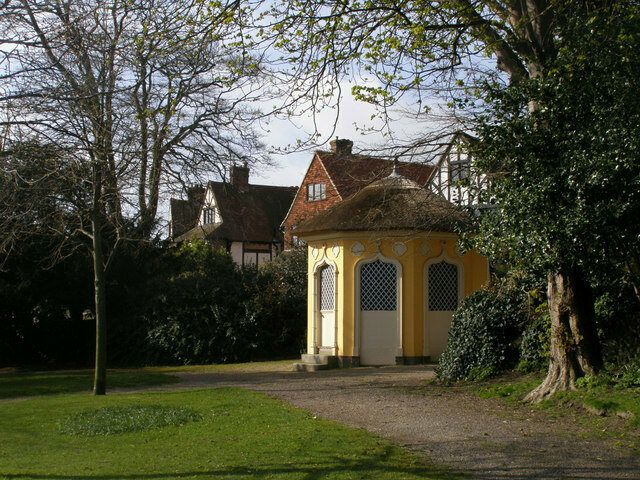 You know those classical little “folly” buildings that dot the English garden landscape? Well, it turns out that many of these were not strictly ornamental. 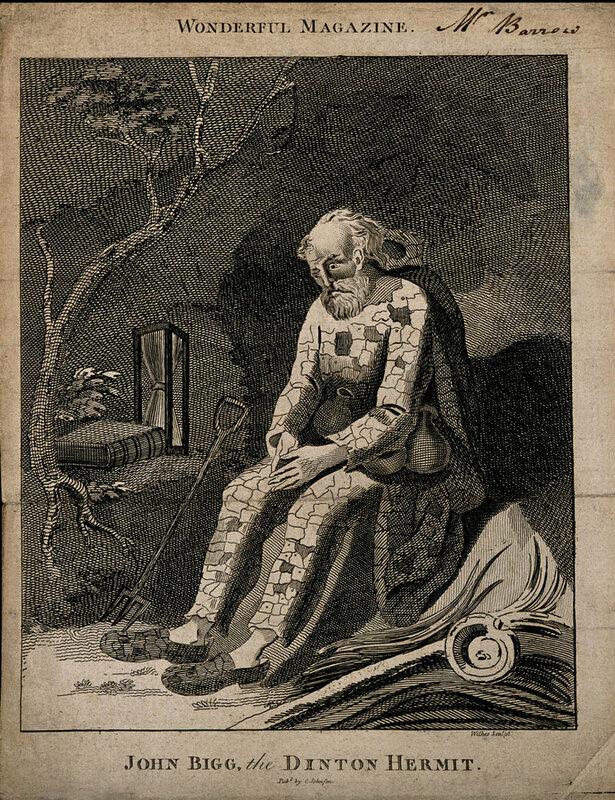 Gordon Campbell, a Professor of Renaissance Studies at the University of Leicester, has published The Hermit in the Garden: From Imperial Rome to Ornamental Gnome , the first book to describe the phenomenon of the ornamental hermit in Georgian England. During the 18th century, it was the fashion among the elite to hire men to live in their gardens, pretending to be a rustic part of the landscape. Rather than write about what he’s discovered, I’ll allow Professor Campbell speak for himself in this video . As Campbell explains, whether this method of earning one’s living was irksome or ideal would depend upon the candidate’s own particular outlook on life. “Recruiting a hermit wasn’t always easy. Sometimes they were agricultural workers, and they were dressed in a costume, often in a druid’s costume. There was no agreement on how druids dressed, but in some cases they wore what we would call a dunce’s cap. It’s a most peculiar phenomenon, and understanding it is one of the reasons why I have written this book.” An employment ad referenced in Sir William Gell’s A Tour in the Lakes Made in 1797 states that “the hermit is never to leave the place, or hold conversation with anyone for seven years during which he is neither to wash himself or cleanse himself in any way whatever, but is to let his hair and nails both on hands and feet, grow as long as nature will permit them.” Often symbolic props such as a skull, a book, and an hourglass were used to help convey to the visitor the image of melancholy, a state of mind much admired by the upper class. The garden hermit fad began way back in ancient Rome and extended to the end of the 1700’s. It’s speculated that the custom of religious persons shutting themselves up for meditation and prayer devolved into a sort of paid profession. The garden hermit custom began way back in ancient Rome and extended to the end of the 1700’s. It’s speculated that the custom of religious persons shutting themselves up for meditation and prayer devolved into a sort of paid profession. While the custom died out around 1800, the roots of the plastic garden gnome, which is alive and well today, may very well spring from those of the hermit himself. Lavender, one of the most beloved of herbs, has been is use for more than 2500 years. The Romans are credited with naming this most aromatic of herbs, some say because of its use in washing (lavare), but others believe it derives from “livendula” (bluish.) I’m inclined to favor the latter theory. In ancient Greece and India, and also in the Bible, this plant is called spikenard. Although today, lavender is strongly associated with England , it is not native to northern Europe, but to the warmer climate of the Mediterranean. Originally, it was probably put under domesticate production in Arabia. In Egypt, Phoenicia, and Arabia, lavender was used as a perfume and for mummification. It spread from Greece into Europe around 600 BCE. The Romans made use of it in their elaborate baths. By the early middle ages, washerwomen were known as lavenders, for spreading clothes to dry upon the bushes and for scenting clean clothes in storage. It was during the the same eras that monasteries began cultivating lavender in their “physic gardens”. Hildegard von Bingen made lavender water, a mixture of lavender and gin or brandy, as a remedy for migraine. Much of the folklore surrounding lavender is ancient. Cleopatra is said to have worn its scent (her secret weapon!) to seduce Julius Caesar and Marc Antony, and some claim that the asp that delivered that fatal bite was hidden among her lavender bushes. Adam and Eve are credited with bringing the plant with them when expelled from the Garden of Eden. The Bible also tells us that Judith wore perfume containing lavender to charm Holofernes before killing him, and in the Gospel of Luke, Mary washes the feet of Jesus and anoints them with ointment containing spikenard, one of its other names. According to one story, lavender got its scent from the clothing of Jesus when his mother hung his clothes on a bush to dry. Many Christians crafted crosses with it to ward off evil. 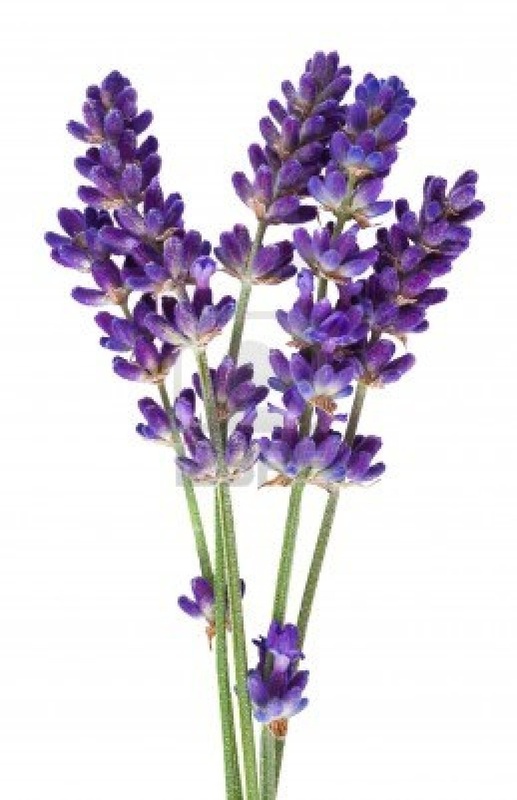 A natural insect repellant, lavender was pressed into use as a plague antidote , worn in bunches tied to one’s wrists. (It probably repelled the fleas whose bites caused plague.) After robbing graves, thieves washed up with a concoction called “Four Thieves Vinegar”, to protect themselves from contagion. In France, it was noted that glovers, who perfumed their products with the herb, never contracted cholera. In the New World, the Quakers were the first to cultivate and sell lavender. That you and I, diddle, diddle, must lie together. The modern version can be heard here. Because of lavender’s purported ability to repel evil, it was (is) often used, especially as incense, around Midsummer’s Day, in conjunction with St. John’s Wort. Cleopatra notwithstanding, girls who wore lavender sprigs on their persons were supposed by be well able to preserve their chastity. 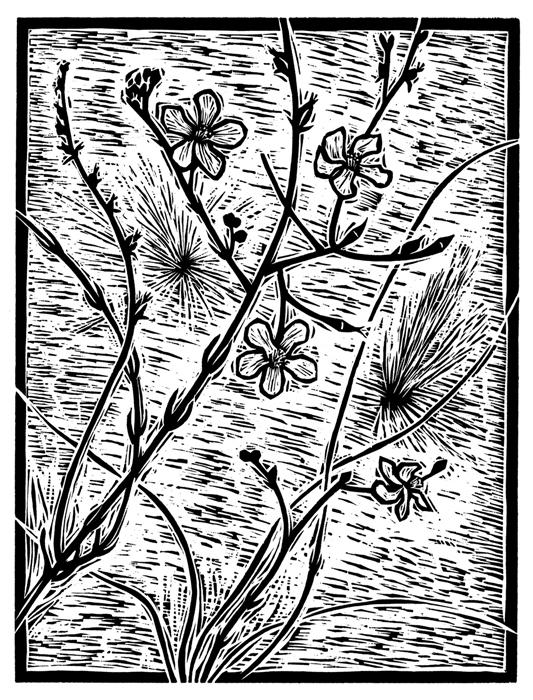 In magic, witches are said to prize the herb for its ability to increase clairvoyance, and a mixture chamomile , lavender, mugwort, and rose petals will attract sprites, fairies, brownies, and elves. Lavender has brought color and fragrance into our lives since time immemorial. Today there are over 115 species cultivated all over the world, and lavender products are inexpensive and readily available. Bring the charm of this ancient plant into your own life. 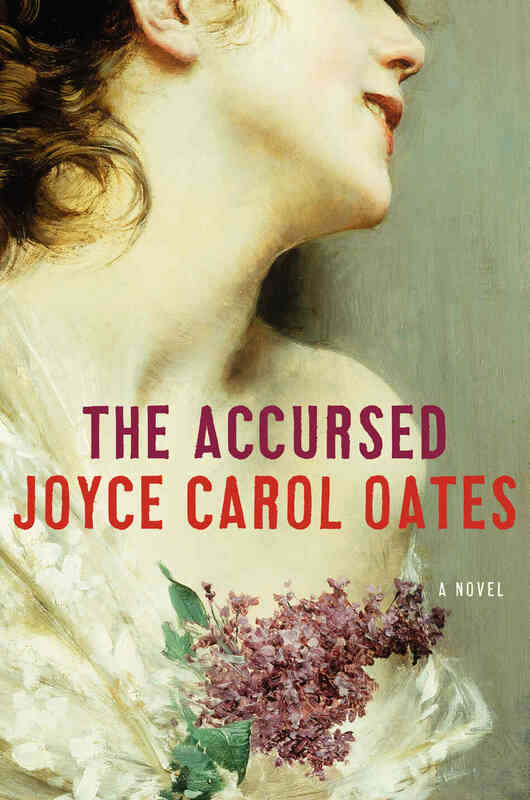 The Accursed is a tricky novel to categorize. Among its various features are elements of the gothic, the paranormal, fantasy, historical fiction, and parody. The story is set at Princeton University in the year from 1905 to 1906, and reflects a Gilded Age mindset among upper crust characters,of the type that used to be referred to as WASPs. In style it is reminiscent of Edith Wharton in its formality and use of language. The plot, related by a fictional historian who draws from and interprets primary sources such as personal journals, concerns a series of tragic events that plague Princeton’s elite families. But don’t expect such mundane troubles as health epidemics or train wrecks, for Princeton is about to be invaded by demons, vampires, and snakes. What the novel is really about, however, is social injustice, and the propensity of the rich and famous to sweep it under the rug. At the turn of the twentieth century, the socialist movement was gaining momentum, and public outrage was about to be aroused, but such major changes as women’s suffrage, gender roles, labor rights, poverty, and racial violence take decades to achieve results. In The Accursed, readers meet personages from both sides of the arguments. Woodrow Wilson, then president of the college, represents the old school, interested in maintaining the status quo for the wealthy industrialists and unwilling to take a moral stand even when lynchings occur in the neighboring town. On the opposite side, Upton Sinclair has just published The Jungle, and he is held so in thrall by his socialist ideals that he can’t be bothered to attend to the needs of his wife and infant son. Mark Twain makes sporadic appearances as acerbic commentator. The Accursed, I believe, is overly long. Some of its passages, however, are truly comical, as when the narrator describes an emergency conference called by President Wilson to talk about “the unspeakable”, and none of them knows what they’re talking about. (Nor does the reader, though it’s not hard to guess.) One of the faculty wives, who refers to herself as Poor Puss, is a professional invalid who relates her view of the Princeton Curse in her diary. But there are long passages dealing with physical and emotional misery that could stand some cuts here and there and still remain effective. This intricate book, the third in Ms. Oates’ gothic series, has been critically acclaimed by professional reviewers. If you want to know if the demons are real, or simply symptomatic of the characters’ collective feelings of guilt, you’ll have to decide for yourself.